… and why it’s not too late to defeat them. In the beginning of an intimate relationship, new partners strive to give it all they can. They want to love deeply, give from their hearts, and for their partners to express themselves similarly in return. They are very careful to practice those behaviors that keep their lovers close and intimacy strong. Sadly, as their relationship matures, new behaviors all-too-often erode the love they’ve created. As more time goes by, two people who once felt loved and treasured now feel distant and unsafe to each other — and suddenly, they realize their in a relationship without intimacy. And very often they don’t even realize how they’ve gotten that way. 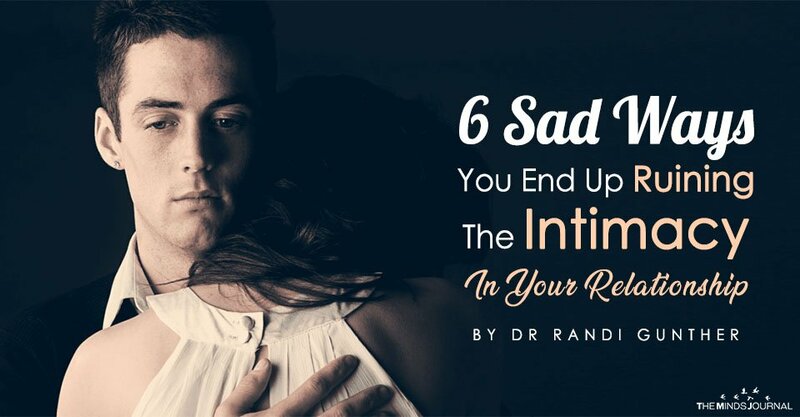 There are six common behaviors that damage loving relationships if they continue. The struggling partners I work with often slip into these destructive patterns without even realizing it. Had they known about them earlier, they could have stopped the damage that resulted and saved the intimacy in their relationship. Identifying and recognizing these six behaviors is the first step to healing, but it is only the beginning. It takes commitment and hard work on the part of both partners to stop these enemies of intimacy from undermining their positive feelings towards each other along, with a mutually sacred promise to keep these behaviors at bay in the future. 1. Disconnection: You’re increasingly distant and keep pulling further away. Remember that man who couldn’t get enough of you? He dropped everything when you needed him and turned his attention to you immediately. Nothing else took precedence over your desires, no matter how small. He kept a list in his mind of anything that was important to you and made sure it was available even before you remembered yourself. But over time, things changed. Now, he’s often preoccupied with matters that clearly come before you and the relationship. Yes, you can still get his attention but it takes work, justification, and presenting your needs at “just the right time”. He tells you that he feels terrible when he forgets an important date, and you are supportive. Yet, those times you don’t feel central to his life anymore are increasing. You don’t want to seem needy, but you’re feeling more and more neglected and sometimes ignored completely. Where is that guy who put you first no matter what? He tells you that he still loves you, but he’s just not available the way he was. You can’t pretend anymore. He is definitely more disconnected. 2. Dissing: You’re super critical about every little thing your partner does or says. That amazing, compassionate woman you fell in love with now seems like someone you can’t please anymore. You try to talk to her about things you’re upset about, and she responds by telling you that you’re being too reactive, or preaches about what you could have done differently. In her 40-year-career as a clinical psychologist and marriage counselor, She Had Spent Over 100,000 face-to-face hours with singles and couples helping them to sort out their desires and conflicts about intimate relationships. She Had explored all the reasons why their relationships so often start out euphoric only to crumble and how they can turn those disappointments into future successes. She truly believe that the greatest obstacles standing between you and the love you want is often right before your eyes but you are unable to envision the journey. Her specialty is to help you look at yourself and your relationships with heroic honesty and the willingness to look deeply at yourself and what you bring to a relationship so that you can finally create the kind of transformation that will change you forever. You'll finally understand why you've struggled in love, and what skills you'll need to create the kind of relationship you've always wanted - one in which you fall deeper in love while simultaneously scaling the heights of your individual potential. It's how her husband and She have made their marriage their bedrock for over 60 years. Subscribe to her free advice newsletter at www.heroiclove.com where she'll tell you everything she has learned about finding and keeping a truly heroic relationship.